Contributors to this blog include Nathaniel “Q” Quist and Dan Kaiser. On February 28 and March 5, 2018, Memcached DDoS attacks targeted GitHub. LogRhythm Labs performed an investigation into the cause, effect, and outcome of these attacks. The following will help give you an understanding of the background that allowed the DDoS attack to be possible, the vulnerability that was exposed, mitigation techniques, and AI Engine rules that can detect Memcached attacks targeting or originating from a client environment. The recent Distributed Denial of Service (DDoS) attacks raised the bar for attackers even higher with two highly publicized attacks against GitHub—an online repository for open source computer code. Both attacks were made possible by vulnerable Memcached servers. Memcached stands for memory cache, and these servers allowed threat actors to perform heavily amplified reflection attacks against GitHub by exploiting a recently released attack. The first attack took place on Wednesday, February 28, 2018, and set a record high bandwidth usage of 1.35 TBPS—shattering the previously held record for the Imperva Incapsula network attack. This latest record was short-lived, however, and just 5 days later, on March 5, 2018, the record was broken again when GitHub was targeted a second time with a DDoS that reached 1.7 TBPS of traffic! Fortunately, architecture changes in the method of deployment of Memcached servers can easily prevent this type of attack. However it is important to understand how the cybersecurity industry got to the point where a system designed to make services more flexible and more accessible, could be used to bring any network to its knees. Memcached is a storage service providing large quantities of RAM for data storage and retrieval. Memcached servers typically support database-driven websites by storing frequently requested data and objects in the local memory. Since memory is much faster to query than most other resources, this data is more readily available once cached on the Memcached server. If the Memcached server does not hold the desired data or information, the webserver will query the slower database and then store the result in Memcached. The vulnerability affecting Memcached was discovered the week of February 26, 2018. The vulnerability targets the Memcached listener hosted by default on UDP Port 11211. At the time of this blog, there are two unique, open-source Proof of Concept (PoC) exploits published: one exploit targets a static list of 17,000 unsecured Memcached servers, and the other allows the user to select a target. According to researchers from Cloudflare who have performed analytics on the Memcached PoCs, as well as on the live attacks, the reflection attack has an extremely large amplification vector at more than 51,000 times the original request! The LogRhythm Labs team has created the following rules to assist in the identification of Memcached attack traffic either targeting or originating from the client network. These rules are not designed to mitigate any malicious Memcached attacks, but are designed rather to alert security operations center (SOC) analysts should any Memcached attack attempts be made. These rules must have Knowledge Base (KB) 7.1.430.1 or higher before being deployed within the environment. These rules were specifically designed to use Firewall-specific log sources. The Memcached DDoS attacks targeting GitHub attacks set record high bandwidth usage, indicating a high potential for impact on the business and its users. Hackers are evolving both their scope and method of attack. To keep up, your organization needs to be able to rapidly detect threats such as the Memcached DDoS attacks. 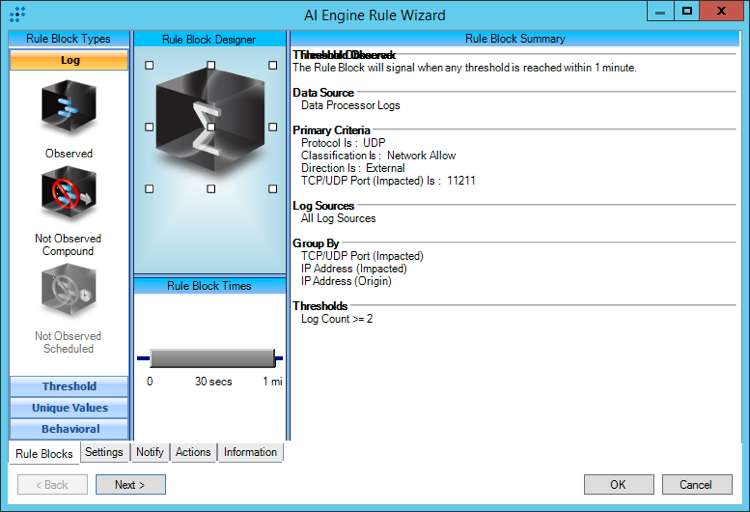 LogRhythm AI Engine rules can help automate threat detection to ensure your business stays one step ahead of cyberattacks.